Insulspan’s industry-leading, ready-to-assemble (RTA) building system gives residential and commercial builders a competitive edge over traditional stick frame construction. Our system facilitates faster framing times, less job site waste, and a reduced dependency on traditional framing crews. The Insulspan® SIP system accelerates construction time because SIPs are truer, straighter, and faster to install than stick framing. This faster assembly means building with SIPs is not as affected by the seasons. In fact, building with SIPs can reduce the time needed to reach the dry-in phase by up to 50%. 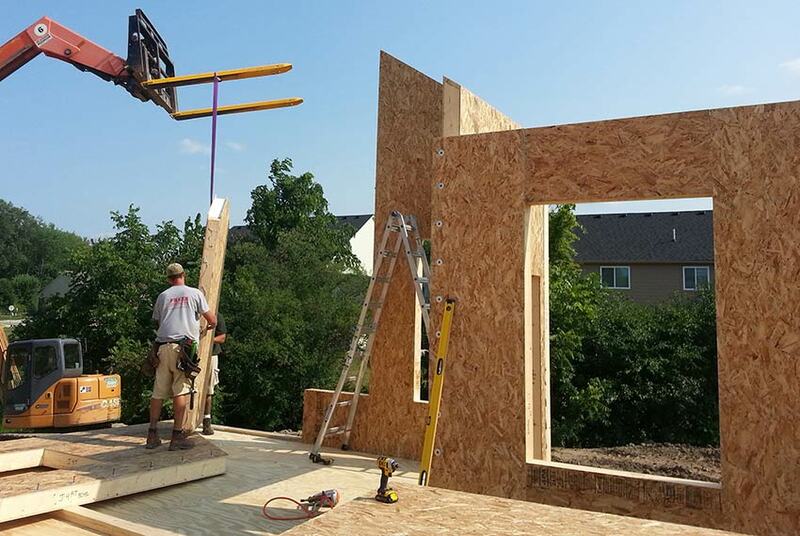 Insulspan’s ready-to-assemble SIPs also eliminate on-site, on-the-fly calculations, and cutting. In turn, the chances for error and the resulting delays on your project, diminish. Precisely cut in a controlled manufacturing environment, your Insulspan SIPs meet your exact blueprint specifications. This means the panels arrive at your job site as a true, ready-to-assemble building system. Prefabricated building methods are in high demand, and Insulspan SIPs are a great prefab building solution. For example, Insulspan SIPs combine a building’s framing and insulation into one step. Thus, reducing the need for two subcontractors – framers and insulation installers. Additionally, wire chases for electrical can be cut ahead of time, during the manufacturing process, at standard heights for outlets and switches as well as wherever they are specified in the construction drawings. Finally, with Insulspan’s ready-to-assemble package, the lumber needed during the installation process is pre-cut. This includes the lumber for the window and door bucks as well as the panel-to-panel connections. The lumber is pre-installed where possible. All additional materials needed for panel installation is provided, including sealant, tape, foam, fasteners, and building wrap. SIPs improve a project’s overall efficiency and job site accuracy. When you use Insulspan’s ready-to-assemble (RTA) package, building can start as soon as the SIPs are delivered, using our detailed, high quality shop drawings and installation guide. Building with ready-to-assemble SIPs also reduces your dependence on framing crews. Utilizing smaller crews decreases your overhead labor costs and limits the time your crew stands around waiting for materials or a foreman. Using SIPs significantly reduces job-site waste and material walk-off. Additionally, SIPs decrease the chances of external job site theft since they allow you to lock up a building faster than a stick-built building. Finally, building with Insulspan SIPs means you receive your delivery when it was scheduled. We leverage our strong relationships with logistics companies while coordinating with you. This ensures your SIP system package arrives perfectly timed for the next step in your construction process. We recognize that the most successful projects are the well-planned ones. It’s why we offer builders and architects extensive technical resources, including product and technical details as well as construction assembly details. Your access to online instructional videos, on-site technical advisors, and our hands-on seminars at Insulspan University, means we are always available for expert advice and assistance during and after your SIP install. Find out how you can save on construction time, cost, and waste with Insulspan SIPs.